Linea is my first line follower based on Arduino. If you use gear motors it is important to use also a motors driver, because Arduino can’t feed the motors with the high current required. When the emitter emits light, the light is reflected by the floor. 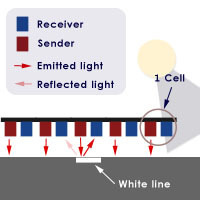 If the line is white and the sensor is above the line, the white line reflect all the light, so it permits to understand that the sensor is effectively above the line. Instead if the sensor is over the black surface, the sensor doesn’t reflect the light, so we can understand that the sensor isn’t above the line. 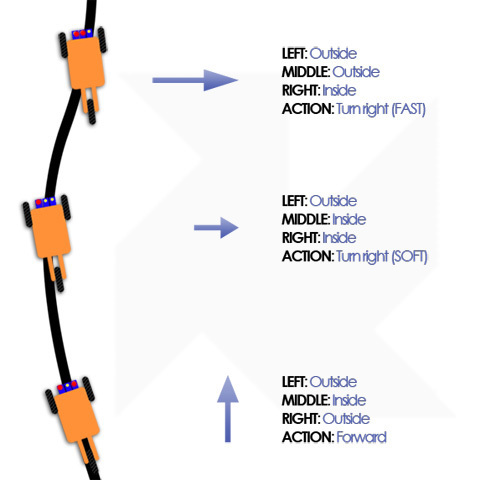 If we have many IR sensors, knowing which sensor is above the line, lets to understand if the robot is going out from the middle of the line, at the right or the left side. In the picture above are shown 5 sensors, but is not unusual to use 8 or 10 sensors. The minimum required is 3 sensor (left, straight, right). The robot, mostly if the line is curved, will go out of the path. It is important to teach to the robot how to maintain above the line. Usually, it is possible to do this with a motion control and the PID (Proportional-derivative-integral) control is the most famous. This control will try to compensate the error, i.e. the misalignment from the line. You can find some details about PID in wikipedia. The combined readings from the sensors are used to understand if the correction done by the control have to be hard or soft. 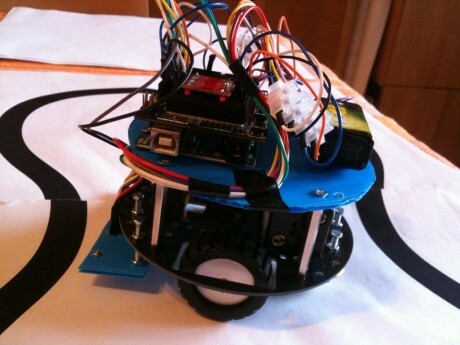 This robot was shown on the Arduino Day, in Rome (Italy), in April 2011 and use a Pololu sensor with 8 IR leds ( link), very cheap (14 euros). 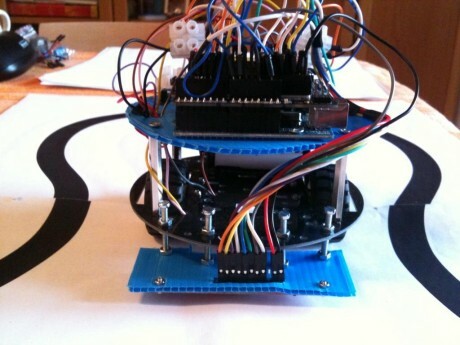 It is offered with an Arduino library, made by Pololu. 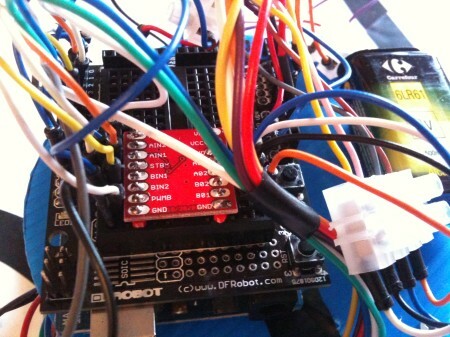 This library resolves all the interfacing problems with Arduino (yeah!). 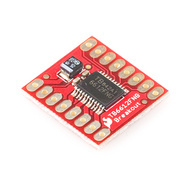 The motor driver is a Sparkfun module (link) , very very cheap (8 euros), that can feed up to 1.2A. 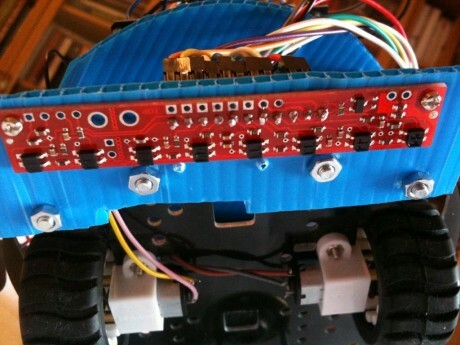 It supports 2 gear motors and lets the PWM usage. For my convenience I assembled the motor drivers on a breadboard shield, but it is enough a normal breadboard. 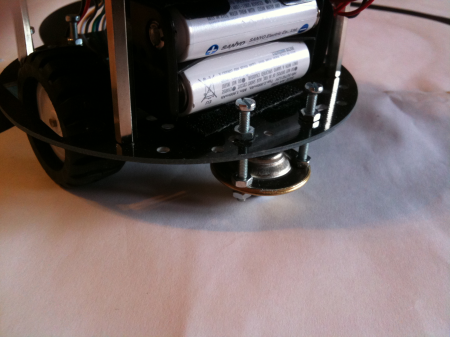 Others components (ball caster, sensor support, batteries) are self made or bought in a hardware shop. // 80*20 = 1600 ms.